The CycleOps Fluid 2 entered the exercise scene in 2005, so it’s an older model that still gets rave reviews from customers in 2014. People love the low $299.99 price tag on Amazon.com, and they appreciate the simplicity of the settings. 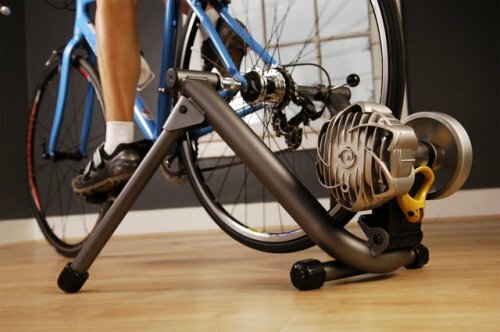 You simply hop on this trainer to get amazing cycling motion and in-turn legs that are in tip-top shape. The design builds the cycling experience into the structure, with a flywheel that creates road-type inertia for a more interesting workout feel. That’s just the beginning of the advantages of this cycle trainer. When the CycleOps hit the market, it was praised primarily for its simulation of the on-road cycling experience. It really feels like you’re out for a spin on your bike. Its “Power Band technology” creates a resistance level that is consistently challenging and keeps things interesting by simulating gear-shifts during the workout process. Like all cycle machines, this recreation of cycling fun helps to motivate people to work out just because it’s fun. The CycleOps didn’t get all rave reviews, though. Customers highlighted a few concerns in reviews that mostly focused on the cooling mechanism, comparisons to older models, and the reality that a cycle machine is great for what it does but simply doesn’t vary up workouts. The CycleOps Fluid 2 is an inexpensive, durable machine that puts its focus on cycling. There aren’t a ton of workout options to choose from, but it does throw in a nice climbing trainer exercise that gives you a bit of variety. While some customers complained that the machine didn’t offer enough variety to keep things interesting, these people forget that the heart of the cycling machine is the pure, unadulterated feel of on-road cycling, which the CycleOps simulates to perfect in the eyes of almost every customer. Resistance options on the CycleOps Fluid 2 is super tough and gives even the most advanced cyclist a challenge to live up to. Customers love the resistance options and also the internal cooling system that keeps the cycle running seamlessly. The few complaints that customers have about the Fluid 2 center around its inability to live up to past models, but they also point out that while the stability seems to suffer a bit because of the increased speed, it’s still a harder workout than past models offered which is what most cyclists would prefer anyway. Not ever on-road ride is as smooth as possible, and it’s okay to shake things up. The cycle still remains steady throughout the workout. For the price, the CycleOps can’t be beat. It offers a hard, consistent workout that avid cyclists can always depend on to workout. The workout is always focused on the leg area, which is exactly what a cycle machine should do. The price tag is just the beginning of what makes the Fluid 2 one of the very best budget models out there, and it’s why people continue to buy this machine almost a decade after its initial introduction to the fitness world. It comes highly recommended by customers, and sells in the modern world because it can still compete with newer models.